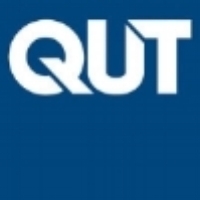 The Flying Scientists Initiative is provided in collaboration with the Queensland Office of the Chief Scientist. The 'Flying Scientists' are early career researchers that accompany Young Science Ambassadors into regional Queensland centres for community STEM events. 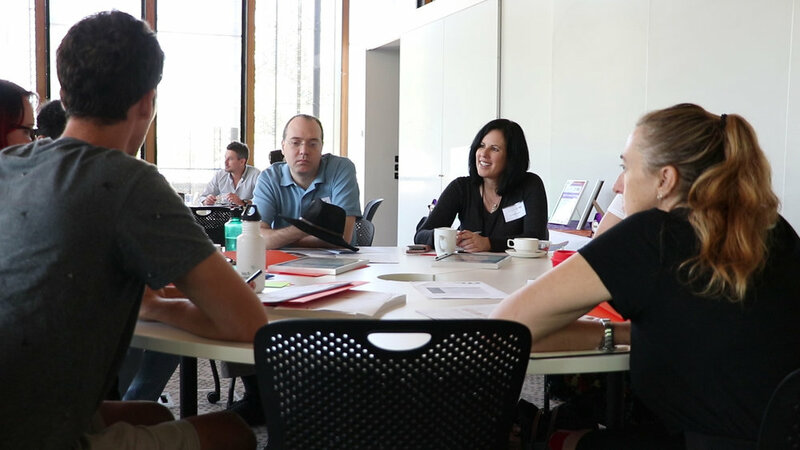 The initiative has been developed to address the shortage of science-related events convened outside South East Queensland. Watch this space for the 2019 schedule of Flying Scientist events - coming soon! To check out the Flying Scientist events, follow us on Twitter, Facebook and Instagram. Archaeology at World Science Festival in Gladstone! Dr Langley and Wonder of Science Program Officer (and palaeontologist) Dr Kaylene Butler set up a stall to teach students about the difference between Archaeology and Palaeontology as well as some of the amazing research happening right here in Queensland. Dr Langley brought along incredible casts of ancient human skulls (such as Homo neanderthalensis and Homo floresiensis) while Dr Butler brought along 3D printed models of her ancient fanged kangaroo skulls. Students and members of the community also had the opportunity to play a game to identify what an archaeologist would study and what a palaeontologist would study in order to win a coveted UQ Science Squishy Toy (see below). Dr Langley and Dr Butler were kept busy over the course of the two days with hundreds over people walking through the doors of the Gladstone Entertainment Convention Centre. Hopefully they inspired a few future scientists along the way. Flying Scientists enjoy morning tea with the Minister! 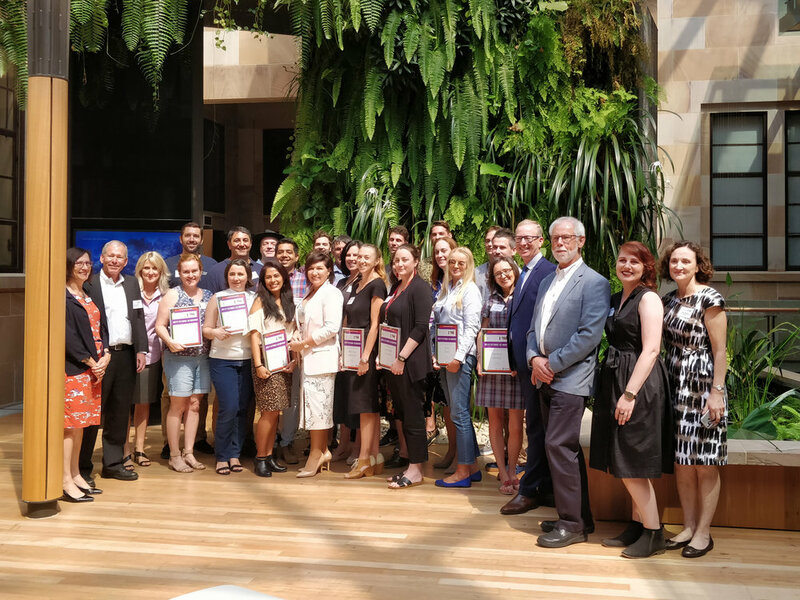 Twenty-two new Flying Scientists completed their induction program on Tuesday 19 February and were joined for morning tea by The Honourable Leeanne Enoch, Minister for Environment and the Great Barrier Reef, Science and the Arts. 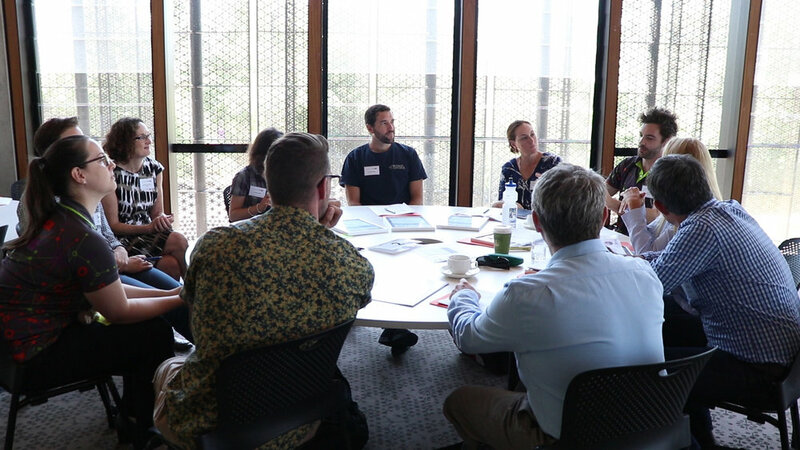 The event was hosted at the Global Change Institute at The University of Queensland with the induction facilitated by the Wonder of Science team. Early-career researchers were selected from a group of over 170 applicants for the Flying Scientist program. During the induction session, the scientists explored ‘effective science communication’ as well as learning about the purpose and value of the flying scientist program. 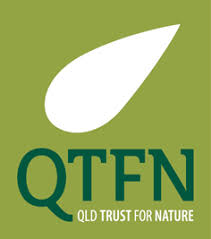 The Flying Scientists Initiative is provided in collaboration with the Office of the Queensland Chief Scientist. The scientist will be venturing into regional Queensland centres for community STEM events and school visits. In 2018, over 8,000 students and members of the community participated in community events in regional areas including Weipa, Taroom and Cloncurry plus World Science Festival events at Gladstone and Chinchilla. Wonder of Science is looking forward to another excellent year for the Flying Scientists. Dr Sri Srinivasan (pictured below, centre) is a renowned Queensland researcher who, in 2017, received a Prostate Cancer Foundation of Australia John Mills Young Investigator Award to pursue as Early Career Researcher at QUT in partnership with Queensland Health (Pathology) and the Translation Research Institute, Brisbane. 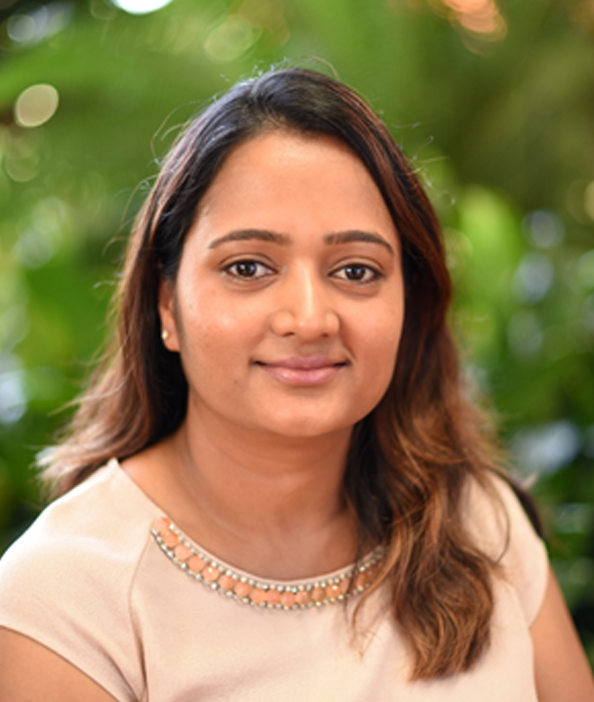 Dr Srinivasan presented a public seminar at Central Queensland University on 28 November regarding her research on why understanding our genetics matters in relation to risks associated with prostate cancer. 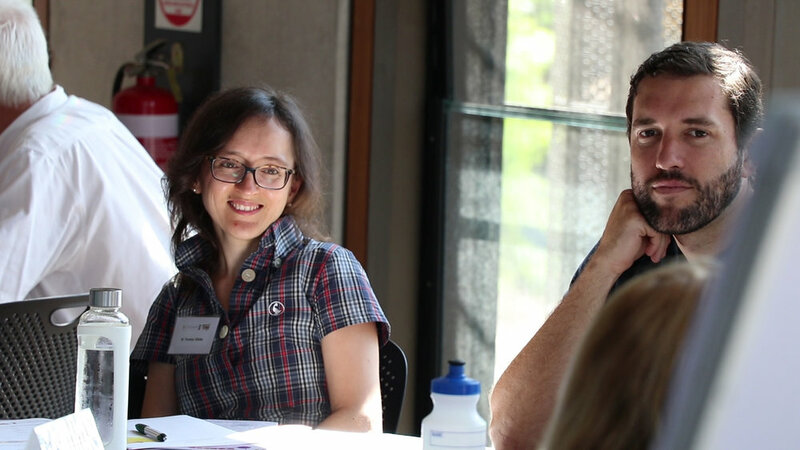 She then teamed up with researchers from Central Queensland University, Dr Lee Barber (left) and Professor Matthew Rockloff (right), for a panel discussion, taking questions from the audience. Dr Lee Barber is Head of Course - Physiotherapy, CQUniversity and an Advance Queensland Research Fellow in muscle mechanics, gait analysis and functional capacity in individuals with cerebral palsy (CP). Dr Barber is an early career researcher within the Australasian Cerebral Palsy Clinical Trials Network for early detection and optimising effective interventions for children with cerebral palsy. Prof Matthew Rockloff completed a Ph.D. in psychology from Florida Atlantic University in 1999, and is the current Head of the Experimental Gambling Research Laboratory at CQUniversity. Prof Rockloff was named in the Top 10 Unijobs Lecturer of the Year Awards in 2012, 2013 and 2014. He is the recipient of the 2017 Ig Noble Prize in Economics for research on how contact with a live crocodile affects a person's willingness to gamble. 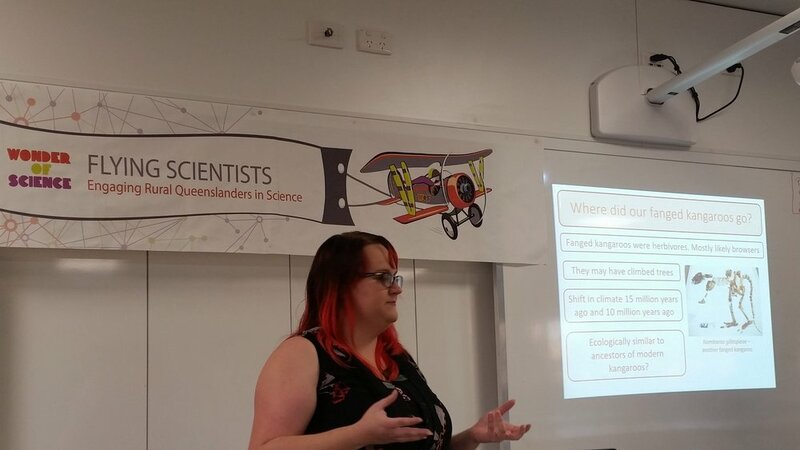 Dr Kaylene Butler shared her paleontology research with excited teachers, students, parents, and other members of the community when she spoke at Cloncurry State School on the 9th October. The presentation was a great lead-in to the Mount Isa Regional Conference held the following day. The children loved picking over the bits of rock and bones that Kaylene had brought along as a hands-on sorting activity - an example of one of the techniques she used in her fieldwork - and passing around the 3D printed ancient kangaroo skulls she had created to model the differences between the species she discovered and named during her PhD - how cool is that!? 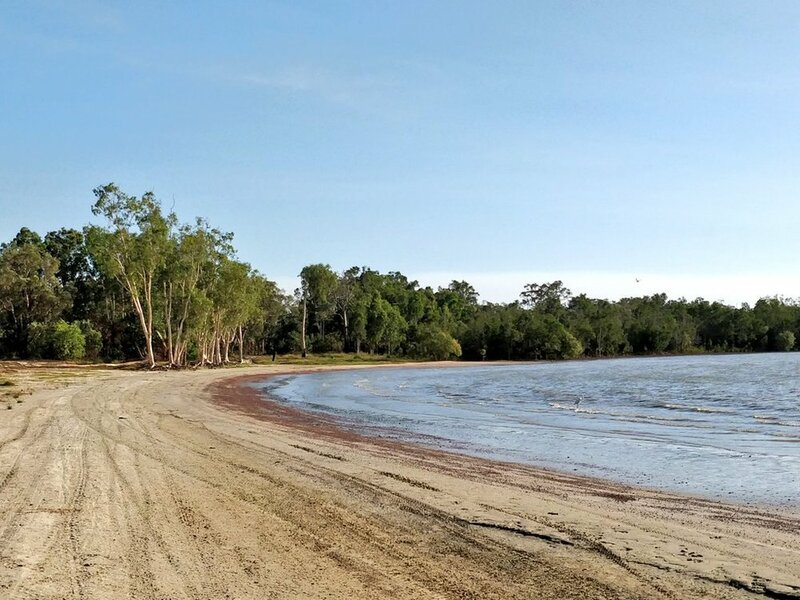 Croc research in Weipa wowed the crowd! 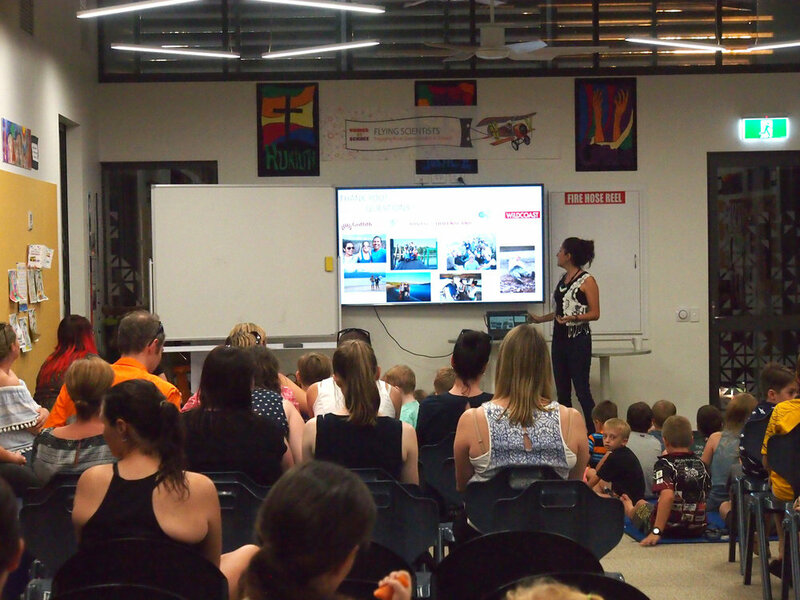 Dr Fernanda Adame wowed Weipa with her Kakadu crocodile research on the 6th September at St Joseph's Parish School. It was a sold out event with extra chairs needing to be brought into the library to seat everyone! Thanks so much for your interest and support, Weipa! 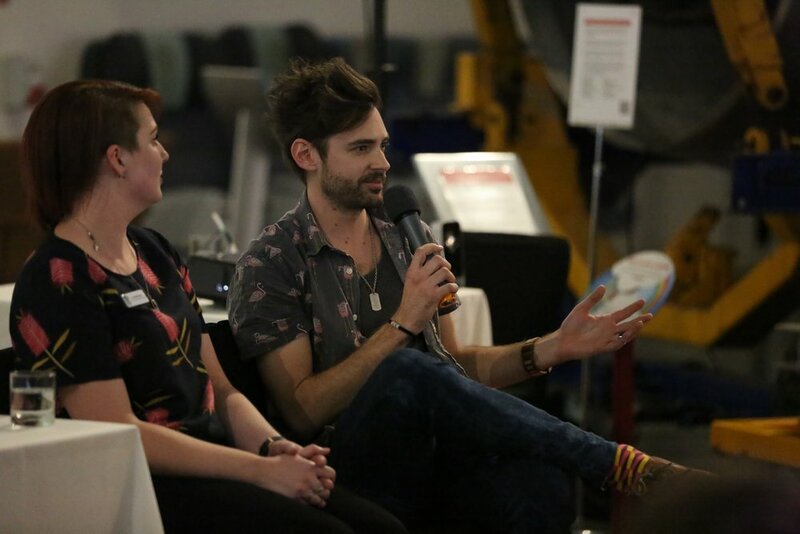 Dr Ken Dutton-Regester (aka The Funky Doctor, @the_funkydr on Twitter) brought his passion for medical research and science communication to Longreach as a panel member for "From Dinosaurs to Drones" - a free event held in regional Queensland for National Science Week. 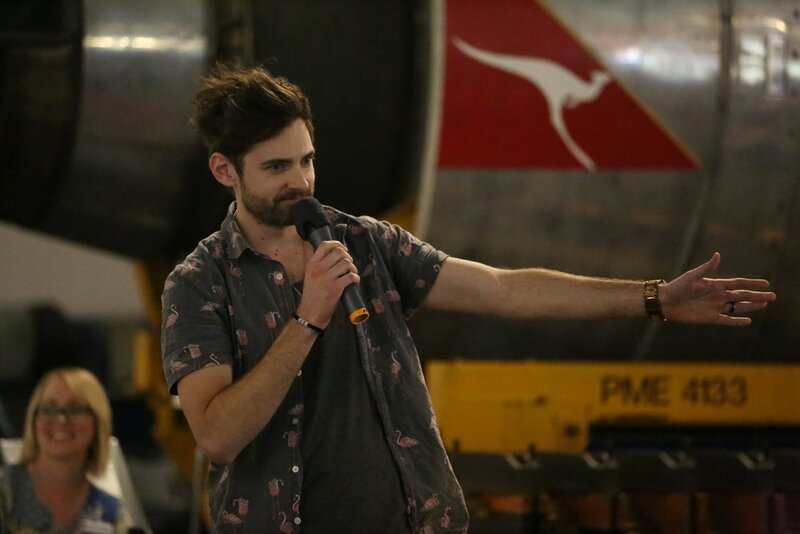 As one of many Flying Scientist events to be held across Queensland this year, we were delighted that this event was aptly held at the Qantas Founders Museum against a backdrop of aeroplanes! Dr Ken spoke to the Longreach community about his work in melanoma research and was joined by panellists Dr Caitlyn Syme (also pictured, below), Dr Monique Grol, Thomas Chandler, and MC Michael Mills. The following day, Dr Ken shared his knowledge with Longreach school students about how sunscreen works and the important role it plays in reducing our risk of developing melanoma. For a quick tip on reducing your skin cancer risk, check out the clip below. To learn more about the fascinating world of melanoma research, check out Dr Ken's video. Photography: Mr Geoff Crane, Questacon. Video: Dr Nikki Sims-Chilton, Office of the Queensland Chief Scientist (originally posted to @qldscience). Dr Michelle Langley is an archaeologist — an ARC DECRA Research Fellow in the Australian Research Centre for Human Evolution at Griffith University. Her research revolves around exploring the development of human behaviour and cognition through study of the tools and ornaments left behind over the past 100,000 years. She also works on identifying the activities and material culture of children in the archaeological record as well as highlighting the innovative and unique bone and tooth technologies of Indigenous Australia. Dr Paul Luckman is a Research Fellow with the Centre for Translation Polymer Research in the School of Chemical Engineering at the University of Queensland. Paul has an Degree in Chemical Engineering, Masters in Biological Engineering, and a PhD in the Synthesis and Processing of Biomaterials. During his research career Paul has pursued research projects that focus on Biopolymers and Biomaterials, with the broader aim to develop sustainable solutions for industrial applications. Dr Dimitrios Vagenas is the Head of the Research Methods Group at the Institute of Health and Biomedical Innovation, Queensland University of Technology. Dimitrios is a Biostatistician who applies his specialist skills in statistics to biological questions and health-related research. He also helps and educates researchers in designing and analyzing their experiments and interpreting their findings in the most meaningful and scientifically rigorous way. Dimitrios loves to dispel the fear that people inherently have for statistics and uses humor and simple everyday examples in his teaching approach. He is an accredited Statistician from the Statistical Society of Australia and a Member of their QLD branch committee. Dr Makrina Totsika is a Vice-Chancellor’s Senior Research Fellow at the Institute of Health and Biomedical Innovation, Queensland University of Technology. Makrina and her group are dedicated to understanding and combating drug-resistant ‘superbugs’ that cause 700,000 deaths each year. Through a unique approach of disarming rather than killing superbugs, they hope to deliver the next generation of antimicrobials that we urgently need to treat and prevent infections. Makrina is a frequent science communicator and enjoys sharing her science about ‘scary hairy bugs’ with the community. Makrina is QLD’s Young Tall Poppy of the Year 2016 and was also the recipient of the 2016 QLD Senior Researcher Award by the Australian Society for Medical Research. Dr Shihu Hu is an Advance Queensland Research Fellow at Advanced Water Management Centre, The University of Queensland. As an environmental scientist, he has been working on the fundamental understanding of the microbial processes underpin the natural carbon, nitrogen and metal cycles on Earth. At same time as a water engineer, he works intensively with Australian water industry partners in developing and demonstrating novel sustainable wastewater treatment technologies to recover energy and nutrients from wastewater. Nasim Amiralian is an Advance Queensland Research Fellow in the area of nanomaterials engineering in Australian Institute for Bioengineering and Nanotechnology, The University of Queensland. While passionate about fundamental science and engineering, Nasim is strongly focused on pursuing commercial endeavours associated with her research area. This includes working with industry partners to advance and translate her research into products that will benefit the economy and strengthen Australia's position in the global market. Nasim’s research has also been instrumental in fostering linkages and delivering job opportunities for Indigenous Australians. Dr Paul Shaw is an Advance Queensland Research Fellow at The University of Queensland. His research focuses on understanding the properties of light-emitting plastic materials that lie at the heart of next-generation solar cell, display, lighting and sensing technologies. Paul currently leads the sensors research program at the Centre for Organic Photonics & Electronics, which has developed Arbsense, a portable sensor for the detection of explosives. Dr Bridie Scott-Parker is a National Health and Medical Research Council Senior Research Fellow. Bridie’s research focuses on road safety and mental health, as car crashes and suicide are the two biggest killers of adolescents not only in Australia but around the world. Her team of Research Assistants, postgraduate and PhD students are involved in a wide variety of adolescent-focused research, including risks associated with using Facebook, the mobility of youth with autism, verbal and nonverbal communication, teen sleep, self-harm, post-traumatic stress disorder, and improving therapy. Dr Alison McCarthy is a research engineer at the University of Southern Queensland’s National Centre for Engineering in Agriculture developing robotic systems to improve productivity for agriculture. She researches how to use automation to sense soil and crops, determine irrigation requirement and then automatically apply the irrigation requirement. This research aims to reduce water use and labour and improve yield. She is currently working on cotton, dairy pasture, sugarcane and horticulture irrigation systems in Queensland, New South Wales, Tasmania and New Zealand. Paul graduated from the Australian National University in 2008. He worked in industry as a hardware engineer for almost 18months before taking on a postdoctoral position at Yale University in 2009. 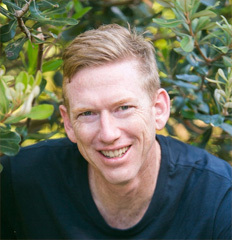 Paul joined the University of Queensland's Robotics group in 2012. Dr Alice Hayward is an Advance Queensland Research Fellow working with Prof Neena Mitter at the Queensland Alliance for Agriculture and Food Innovation, UQ, and the Queensland Department of Agriculture and Fisheries. Alice completed her PhD at The University of Queensland in 2009. Since then she has worked on genetics and whole genome sequencing of important food crops, both at The University of Queensland and as a Young International Scientist of the Chinese Academy of Sciences, China, where she lived for one year. In Prof Mitter’s lab at QAAFI, Alice works in a close team of scientists and industry partners to create change in the way the world produces avocado plants. She is helping to sequence the avocado genome and is focused on creating a sustainable avocado industry for Australia and the world, so that everyone can enjoy avocado on toast! Dr Kate Hutson's research examines aquatic animal parasitology issues that threaten wild, farmed and ornamental fishes. Her research integrates parasite species discovery and biology (taxonomy, life cycles, ecology and behaviour) with practical, applied research (risk-assessment, disease diagnosis, management and treatment) designed to deliver tangible outcomes for fisheries, aquaculture industry and biosecurity management. This combination of pure and applied research has led to the development of unique and strong partnerships between industry, government agencies and other tertiary institutions. Dr Cheryl McCarthy is a mechatronic research fellow at the University of Southern Queensland. Her research involves developing machine vision and sensing systems for agriculture. She has worked on machine vision projects for the beef, fodder and macadamia industries and her current projects include precision sensing of weeds for the sugar, cotton and grains industries. She has a Bachelor of Engineering (Mechatronic) and PhD from University of Southern Queensland. Her research interests include the application of mechatronic engineering to agriculture and imaging spectrometry.